Zamenhof Tago! – every day's a holiday! 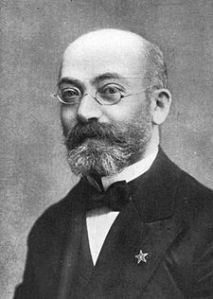 Originally celebrated as Zamenhof Day, Esperanto Day is the birthday of Esperanto founder L.L. Zamenhof. He would be 149 today. The son of a German teacher, Zamenhof was born in Bialystok, Russia, in what is now Poland. He spoke all three of those languages as a child, and studied Greek, Latin, Hebrew and French. He grew up to be a doctor, but had an incredible ability to pick up languages. During his formative years in Poland, conflicts in Eastern Europe led Zamenhof to believe that much of the world’s violence could be stemmed by a common language. Zamenhof set out to create an international language, easy to learn, simple to use, that could unite the world’s speakers for the first time since the Tower of Babel. In 1887 he published a booklet of the rules of “An International Language” using the pseudonym Dr. Esperanto (one who hopes). And now for the first time the dream of thousands of years begins to be realized. In this small French seaside town I have met men from the most varied countries and nations, and they meet each other not as deaf-mutes, but they understand one another and speak to one another as brothers, as members of one nation. One common criticism of Esperanto is that English has become the default “international language”. However, we forget how many languages have attained that position during the peak of their mother country, only to ebb away. The Romans, the Spanish and Portuguese, and the French empires once could say the same. The French delegate, Gabriel Hanotaux, argued that French was and should continue to be the language of international affairs. It didn’t work out that way. Because of Hanotaux’s objection, the League of Nations failed, and the world plunged into the Second World War. Okay, maybe the chain of cause-and-effect wasn’t that drastic, but the twentieth century proved that the ability to communicate was of paramount importance to international peace and stability. Today France is the leading host country of Esperanto’s Pasporta Servo, where Esperanto speakers can travel the globe practically for free, lodging at the homes of Esperanto hosts in 92 countries. The Pasporta Servo is actually a major incentive for young people to learn Esperanto, which can be learned in a fraction of the time of other languages. Of course with the growing popularity of sites like Babelfish, and increasingly accurate voice-recognition software, it may be that one day everything we say will be instantly translated into whatever language the listener desires. But until that day…mi provas lerni Esperanton. There’s not much sign yet of electronic gadgets solving the language problem. Esperanto works! I’ve used it in speech and writing – and sung in it – in a dozen countries over recent years. Indeed, the language has some remarkable practical benefits. Personally, I’ve made friends around the world through Esperanto that I would never have been able to communicate with otherwise. I’ve used the Pasporta Servo, which provides free lodging and local information to Esperanto-speaking travellers in over 90 countries. 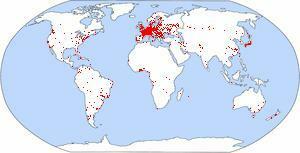 In the past two years I have had guided tours of Berlin and Milan in the planned language. I have discussed philosophy with a Slovene poet, humour on television with a Bulgarian TV producer. I’ve discussed what life was like in East Berlin before the wall came down, how to cook perfect spaghetti, the advantages and disadvantages of monarchy, and so on. It sounds like a great language to learn. The Pasporta Serva alone is incentive enough. Any sites you’d recommend for prospective students? Nestor: Lernu.net is a great place to get some lessons under your belt. Bonŝancon!